Taylor Swift’s Red album has helped her join The Beatles at having three consecutive studio albums at #1 for six or more weeks. Taylor’s previous two albums, Fearless and Speak Now also topped the Billboard 200 for six or more weeks. She is the first female artist to achieve this feat and the first to do it since The Beatles. However, she will have a way to go to beat The Beatles in this record – they have seven straight consecutive studio albums at #1 for more than six weeks. Two other acts before The Beatles have matched the same three album milestone – The Kingston Trio with three and Herb Alpert & the Tijuana Brass with four. While Taylor Swift just joined The Beatles for this record, she has dominated the last seven and a half years on the Billboard 200 with only three other artists having a single album spend six weeks at #1 – Susan Boyle, Eminem and Adele. She has also dominated music awards with six Grammys, eleven American Music Awards, and thirteen BMI Awards among many others. She has sold over 26 million albums and 70 million song downloads. Taylor doesn’t show any signs of slowing down. 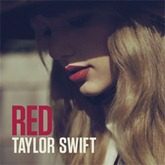 With an upcoming 2013 tour for the Red album and a slew of new award nominations for the album, this 23-year old from Pennsylvania has a long future ahead of her in the music business. She gives parity to that success with her philanthropic support of arts education, children’s literacy, natural disaster relief, LGBT anti=discrimination efforts and sick children charities. Taylor Swift may have matched The Beatles three album milestone with the Red album, but it looks like she will give them a run for the most albums at #1 with a strong musical career still mostly ahead of her. What do you think about this talented American singer-songwriter? Let me know in the comments below!